While I was lying in bed this morning, trying to get better from a something that has decided to give me runny eyes, sniffley nose and a cough, I had a wonderful view of the fog drifting down from the mountain. Being a bit under the weather I did not venture outdoors, so I took some shots from my window and had a good think about calendars. I h ave not yet made up my mind if we are going to do the annual Calendar to send out this year, yes yes I know, time and tide. As I was saying, calendars have always fascinated me especially when they are not arranged in a pattern I am used to. For example, at work, Monday was the start of the week and at home, Sunday was the start. Then someone brought in a French calendar in which the days of the week were arranged down the left side and the numbers were across. That took some getting used to, let me tell you! When I was taking French many lunar cycles ago, we memorized the days of the week along with the months. Mercredi always got me. Why? Turns out it is named for Mercury, as each of the weekdays were named for the planets. Ok that makes sense, but why Wodensday for Wednesday? Just who was he? The German name for their god Mercury. 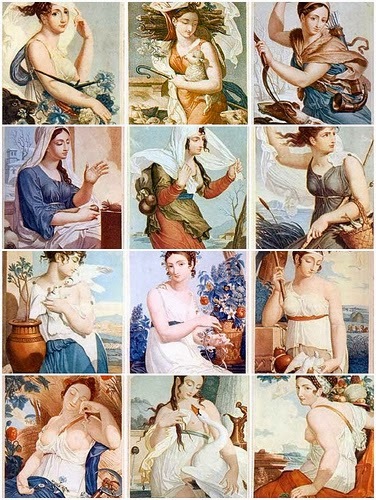 French Republican Calendars for sale in her shop. Waverly writes,"In 1793, the French replaced the old calendar, tainted with irrational religious holidays, with a new rational calendar. The months were named after natural phenomena (Winter consists of Foggy, Frosty and Snowy), and each day was dedicated to a plant, animal or tool." She then goes on to say that she is quite pleased how well it matches the weather and cycles of the Pacific Northwest (Seattle). I hope she makes one available for 2014. I am still mulling over and discussing it with Mr Bear. Blessings of Woden/Mercury to everyone out there.